Next week FOX Sports launches a new 6 part observational series The Call of the Wallaby, looking at Rugby fanaticism with some humorous narration. Rugby Union is built upon a rich history of tradition, pride and honour. It is the fabric which bonds the Rugby community so passionately for their code. But Wallabies fans have remained somewhat silent over the past decade, until now. Seven passionate Australian Rugby fanatics from diverse backgrounds, united by their love for the gold jersey, are calling fellow fans to action. Brought together by their passion and devout patronage to our national representative team, the mission to start a supporter group for the Wallabies was born. 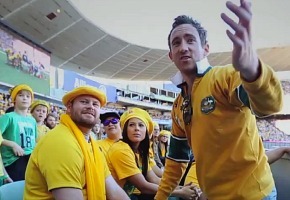 Premiering at 7pm this Tuesday, July 15, The Call of the Wallaby is a new six-part series which follows the newly-formed supporter group, The Gold Brigade, as they attempt to take all that is loud and exciting about Rugby culture and raise it up to the national level. The Call of the Wallaby documents The Gold Brigade’s challenges and successes, as they work together to rally the Wallabies fan base ahead of the Bledisloe Cup match on August 16 – where their success, or failure, will be on show for all to see. 7pm Tuesday, July 15, on FOX Sports 1.